Experience Columbus is embarking upon a unique way to deliver the Columbus message to the rest of the world. It’s uniqueness revolves around what isn’t in Columbus, so rather than boast about everything that’s here, Experience Columbus is taking a bit of a cheeky approach and making a bold announcement about what isn’t here. To get the conversation started, Experience Columbus has launched a YouTube Channel called “Not In Columbus”. Here one can see a somewhat viral-looking set of videos that demonstrate what we don’t do (or have) in Columbus. A vibrant series of print advertisements compliments this message. Experience Columbus is also using Twitter as a method to reach untold numbers of people. Similar to text messaging, Twitter requires it’s users to assemble a quick message of 140 characters or less and then send it out. But unlike text messaging, Twitter allows other’s to subscribe or follow various “Tweets”. Did you know that there is a Pulitzer Prize winning photo exhibit here in Columbus? I didn’t, but I found out about it from an Experience Columbus Tweet. It may sound simplistic, but keep in mind that the New York Times, NPR and other traditional media outlets are using this resource and are reaching people faster and more effectively than at any other time in the history of media. Consider too that SearchTwitter.com compliments Twitter in allowing anyone, anywhere to search a word or phrase and discover who on Twitter is talking about what at any given time. Type in CMH and you’ll the folks who are flying in or out of our airport. You’ll get more information here than by taking a survey at the security checkpoint. Are you on FaceBook? So is Experience Columbus. With over 90 million active users world-wide, it’s only logical that Experience Columbus join in on the action. These new methods of delivering a message in today’s culture of new-media is essential to an organization such as Experience Columbus. As a city that’s known for it’s blogging (8th in the nation) and for its quick adaptation to technology, these methods are now expected – and expected by the very people Columbus is looking to attract. Whether they come here to meet or come here to live, the very first step is to deliver the message. There’s still time today to enjoy the Fourth Annual Ganther’s Place Garden Tour. Come see how the residents of this central-city neighborhood are making a difference. Access to this event is available at no cost. From 1p-6p Sunday July 27th. Ganther’s Place Garden Tour now has a Flickr tag of GanthersPlace08. Use this tag when uploading your photos to Flickr, and in doing so you’ll give the residents the chance to see the photos you took. Because of property tax abatements, residential condo units in Downtown Columbus are likely to appreciate in value less than residential units elsewhere in the region. This might provoke worried headlines in a few years, but this lower appreciation doesn’t imply that Downtown property owners have made a bad investment. These property tax breaks can be substantial. The most generous applies to condos carved out of rehabbed existing buildings; these are eligible for a 100 percent, 10-year tax abatement on the increase in value. That does not mean that property taxes are zero. Owners pay tax on their proportional share of the property’s existing value. Take the Condos at Sixty Spring, for example. A unit in this building assessed at $250,000 would have a land value share of about $17,200, with the value of the improvements accounting for the remaining $232,800. The full tax bill on this $250,000 unit would be about $3,512 per year. But the taxes due are figured on the $17,200 land value plus the share of the building’s pre-rehab value, which is about $3,800, or a total of $21,000. The tax works out to about $322 per year. But after the property has been in service for ten years, the property tax bill will jump to the full $3,512 (probably more because property tax rates are likely to be higher then than they are now). But this property tax break is an amenity, like granite countertops or a second bathroom, and thus increases the value of the unit. You can figure out exactly the value of this amenity: it is the present value of the difference between the full $3,512 that you would pay without the abatement and the $322 that you actually do pay. You save $3,190 in property taxes per year for 10 years. The question is how much that $3,190 is worth today; in other words, how much you would have to put in an account today to be able to pay yourself $3,190 per year for ten years. If you earn 3 percent on your money, the answer is $27,381. Thus, $27,381 of the unit’s value is attributable to the property tax abatement, and the remaining $222,619 is the value of the underlying unit – what it would sell for if there were no abatement. Assume residential property values do not change and you sell the unit after five years. The buyer gets only five years of property tax savings, so the abatement is worth less. If the buyer earns the same 3 percent, the five years of tax savings are worth only $14,708. This plus the unchanged $222,619 base property value is what the buyer will pay for your unit: $237,327. It looks like you have sustained a loss of $12,673, but you haven’t. The difference between the sale price and your original purchase price of $250,000 is the value of the tax savings you have enjoyed for five years. Yes, the market makes you pay for these tax savings; there is no free lunch. Should you move to a new abated property as your abatement period draws to an end? The above example implies that it doesn’t matter. You will receive less for the property you sell and pay more for the property you buy. The difference between the two is the value of your additional years of tax savings. So you can pay for additional tax savings by moving, or not. One way or the other, you are just as well off. One potential problem, though, is the change in mortgage escrow payments when the abatements expire. Because the unit in this example is worth $222,619 at the end of ten years, the increase in property taxes increases the mortgage payment by $258 per month overnight. This might create affordability problems for some owners. If all has gone well and they have paid down the principal of their loans, they will probably be able to refinance into a loan with a lower total monthly payment. But it is possible that some owners will be forced to sell. The Columbus Social Media Cafe and your local bloggers invite you to join us for the first ever Flash Mob Food (non)Drive for the Mid-Ohio Food Bank on Monday July 28th. Bring non-perishable food items to donate and have fun doing it. Everyone participating will board the COTA route #3 either at Broad and High departing at 5:57p (same side of the street as the State House) or along it’s route to Lane Avenue. When we arrive at Lane Avenue, we’ll box up our donations and enjoy the company of others at Caribou Coffee, Graeters Ice Cream as well as the other merchants at The Shops on Lane Avenue. The goal is multifaceted. We’ll lend a hand to our local food bank because there is a great local need. We’ll demonstrate the power of our local social media. We’ll demonstrate how easy it is to use public transportation to access good shopping. We’ll demonstrate how public transportation benefits local business and we’ll have fun doing it. COTA route 3 departs (Northwest Boulevard) on-time from Broad and High at 5:57p and arrives at Lane Avenue at 6:22. Join us anywhere along the route, which you can find at this link. Bus fare is $1.50 each way and exact change is required. If you’re commuting by bus to work that day purchase, a day pass (from the driver) for $3.50 and you can use it for the entire day. Just one of the great things about San Francisco is that its a city where you can expect the unexpected. There’s so much free thought in San Francisco that even your accountant gets giddy. So when San Francisco blogger Brent Schulkin came up with the idea to solicit local businesses to bid against one another to set aside a portion of their earnings for energy-efficient improvements, well, it was probably just another idea that hatched itself on a fine sunny day like any other. Brent pursued his idea, however, and created carrotmob. The idea is to organize buying power in such a way that corporations (and in his first experiment with the concept, a neighborhood grocer) find financial rewards through better decision making. To state it simply, use a carrot rather than a stick. He visited twenty-three local convenience stores in his neighborhood and told the owners that he was going to organize a shopping event to draw buyers to the establishment that was willing to set aside a portion of their earnings on that day to upgrade their facilities for increased energy efficiency. The establishment that would set aside the highest percentage would win. Watch how the idea unfolds, as well as the results, in the abbreviated video below. Visit carrotmob.org to watch the full-length version. COTA Neighborhood Guides don’t exist yet, but thanks to Google Maps, I’ve created what could be the model for a more useful way of demonstrating how public transportation serves a specific geographic area. The map I’ve created highlights the COTA transit routes serving German/Merion Village (command + click to open the image to in a new tab/window). 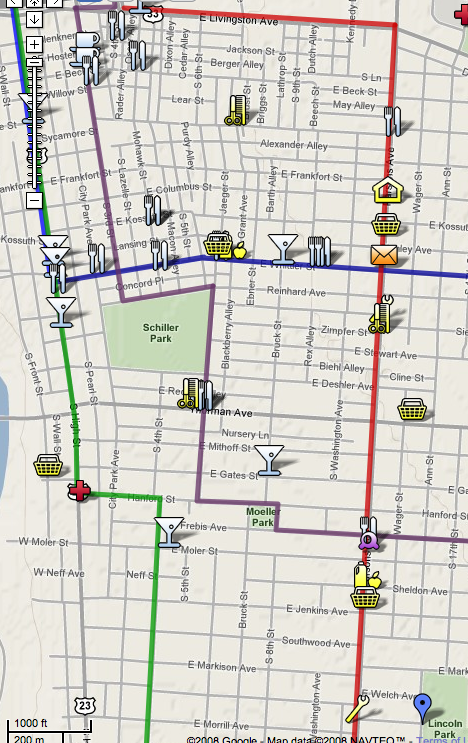 On the map I’ve charted prominent neighborhood establishments such the grocers, the post offices, the library, restaurants and bars. (Is Whittier Street is becoming the South Side’s Restaurant Row?). Also shown are some dentists, some barbers, pharmacies, the city pool at Lincoln Park, as well as South Side Cycle and Mower. With a COTA Neighborhood Guide residents can see public transportation within the context of their daily life rather than an ill-scaled map and gridded time-table. While a time-table is an essential part of a transit map, its only an indication of point-to-point service. Columbus realtors would be served well by COTA Neighborhood Guides.Demonstrating to clients the savings of buying within a Transit Zone would boost both the buying and selling potential of properties. Local business owners would benefit by being displayed within a context of other businesses and thereby create synergy among merchants. Is there a plumber or electrician in my neighborhood? I don’t know, but if they were a sponsor of my COTA Neighborhood Guide, they’d likely get my business. And while COTA Neighborhood Guides don’t yet exist, it is possible to chart your public transportation route via Google Maps. It’s a step in the right direction.